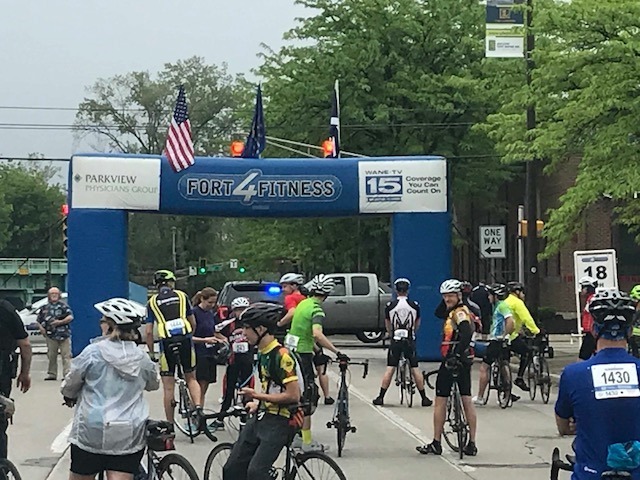 Last weekend I participated in the 7th annual Fort 4 Fitness Spring Cycle event. 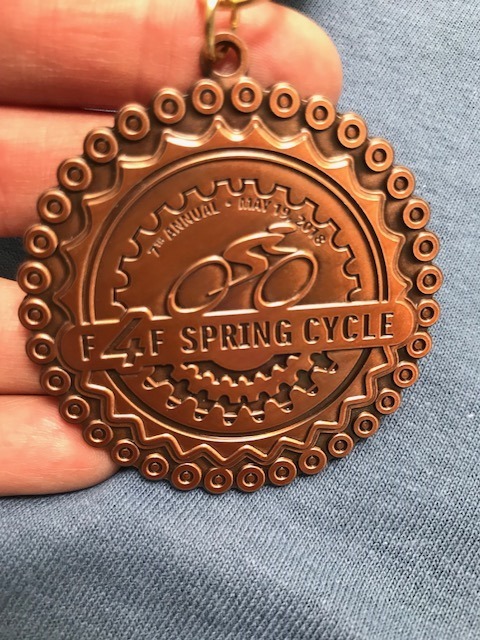 This was the 3rd year that they offered the Metric Century (100K = 62 miles). I participated the first year they offered this distance, 2016, and again this year. The event started at 9am for the 62 & 43 mile events. Then there was a 10am start for 32,16 & 10 mile rides. Ride day packet pick-up was an option. Easy in and out in front of the Ft Wayne Art Museum. The ride then started in front of the art museum with plenty of potties & a row of vendors to scope out before/after the ride. Plenty of room for riders to line up for the start. The 100K ride left Ft Wayne for Antwerp, OH, then returned. Roads were well marked and busy intersections were covered by police & volunteers. The ride out of town & to Antwerp provided a nice tailwind that really pushed us along. But of course, the return trip gave us a headwind that wasn’t quite as much fun. Then the black clouds opened up and we had a some rain for a bit. Mostly country roads with a few busier roads mixed in for connections. Roads were in decent condition but we traveled thru Amish country so there were some rough patches and spots with horse manure. Multiple aid stations provided bathrooms, food & hydration, along with bike support if needed. I believe there were 3 or 4 stops on 100K route. Everyone: riders, volunteers & police support alike were in a good spirits and happy to be out and participate. Riders were spread out pretty well except for the last 15ish miles of the 100K. Once the 100K riders joined the shorter distances, there were more people but since the course covered low traffic areas, it wasn’t an issue, we just had to be more vigilant . As we rode back into town to finish in front of the Art Museum, we wound thru some neighborhoods and traffic increased. The police handled it well and they got us thru all the busy intersections. I noticed a positive change to the course toward the end. We did not ride down the Greenway to finish, but instead came thru town in a designated bike lane. 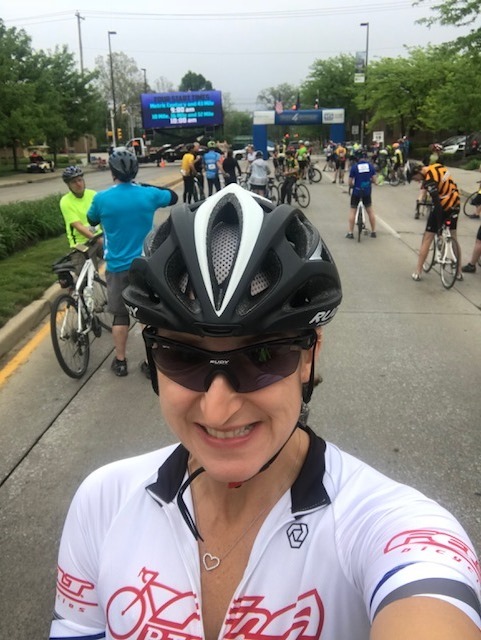 Great improvement from the inaugural ride where it was congested & dangerous at the end as we finished up on the Greenway and were sharing space with non-event riders who weren’t expecting the extra traffic. Overall, great experience. This is definitely an event that I love because it has so many options for cyclists of all ability levels. I love that it’s a family event and even the little ones can participate. There was an after party in front of the Art Museum. Beer. Food Vendors. Tent with seats. Fun to be had. No “free” food this year but our bibs each had a $3 off ticket that could be used at the food trucks. I heard some complaints on this but a lot of people loved it because they had more variety than usual at a post event party. I personally don’t have an opinion. I rarely eat the free food & I didn’t utilize the food truck vendors either. My schedule was tight. I was in and out pretty quickly. 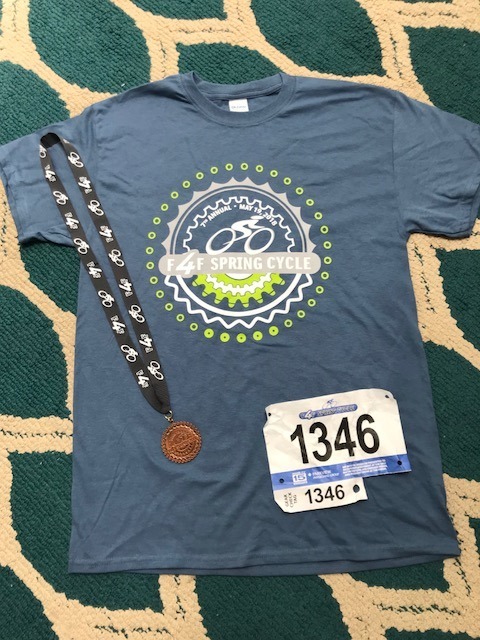 SWAG = Cotton T-shirt & Finishers medal. I really like cycling events. Very low key. You can go as fast or as slow as you like. You can stop at every aid station or pass them all. You get to ride new routes that you would never ride solo. I’d recommend checking out a local ride this summer! They aren’t races, so no need to treat it as one, unless of course, that’s just how you roll, then go kill it. You won’t be alone. The next local ride that I plan to attend is the CASS Housing Ride on June 3rd in Ft Wayne, IN. It’s a charity ride. No official entry fee but they are accepting donations. Register now. GREAT ride, I did it last year. Hope to see you there! It can be a bit challenging to find an early season triathlon that gives you everything you want and more! I registered for the Muncie May Triathlon this year after my beloved Pokagon Triathlon was discontinued. 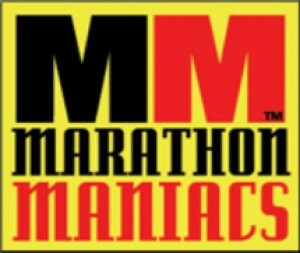 This race is put on by American Multisport & is in Muncie, IN. 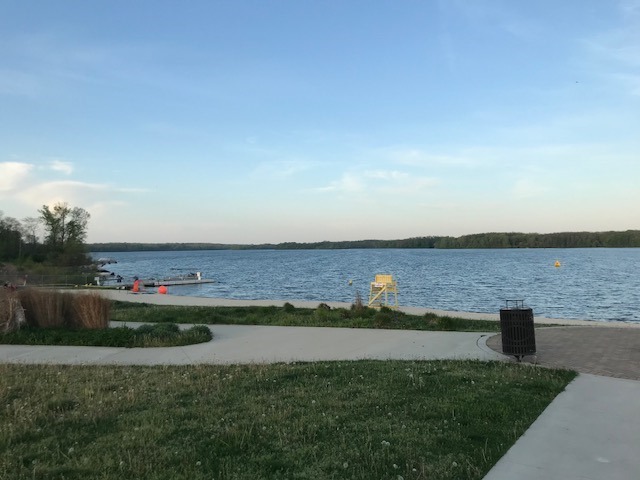 This group puts on several triathlons throughout the year, of varying distances, with races taking place at the Prairie Creek Reservoir. This is the same location as the IM 70.3 Muncie event that is held each year in July. Great way to check out the venue in a low key setting. 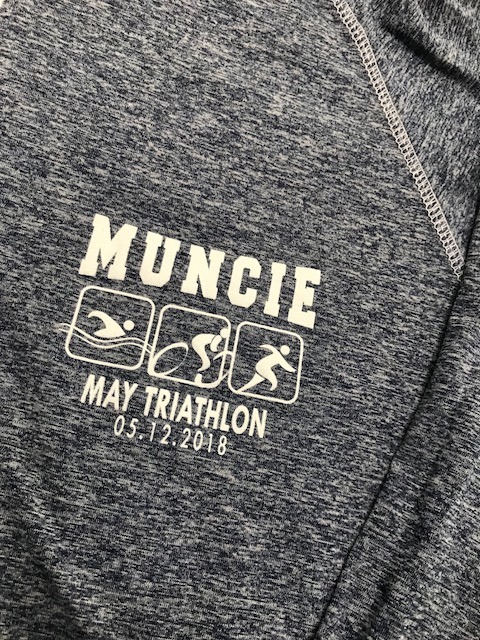 The Muncie May event is in mid May, May 12th for 2018 and May 18th for 2019. One of the first open water events in the Midwest. However, the Prairie Creek Reservoir is on the shallow side so the water heats up quickly with a few nice days. The race this year was wetsuit legal with water temp around 63 degrees. That being said, many events at the reservoir are NOT wetsuit legal, so watch for current info on their website & Facebook page. So what’s the scoop on this race?!?! 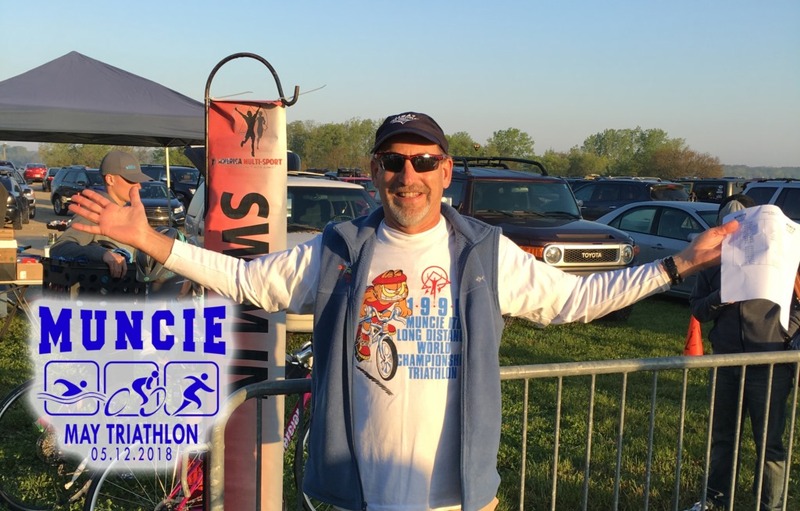 The Muncie May TRI is a great event for athletes of varying abilities. They offer an Olympic distance, Oly relay, Sprint, Sprint Relay, Super Sprint, Duathlon, Du Relay, Sprint Du, Sprint Du relay, & Aquabike. That’s a lot of options and I hope I didn’t miss anything! Race starts at 9am with a race day packet pickup option. Therefore, you can easily drive in the morning of the event if you are within 3 hours of Muncie. Packet pick-up was easy & quick. Body marking on site. Practice swim area open and available to those who want it. And the water is usually pretty calm. Small intimate venue at Prairie Creek Reservoir. Indoor bathrooms & showers. On site parking. If you’ve only been to the Reservoir for the IM event, then go back for an American Multisport event. Totally different atmosphere. Small parking area. Small transition area. Very low key race at the same great venue. Races start at 9am. Super sprint first, then sprint, then Olympic. I did the Olympic and the times estimates were a bit off as to when we got in the water. They waited for everyone in the previous category to get out of the water before the next group got started. Safety first! Then we self seeded and got into the water in pairs. Very easy. No drama. No fighting. Nobody swam over the top of me. Once we hit the water, it was noticeably rough on this particular day. The wind was really blowing and the current in the water was pushing us off course a bit. Tougher swim that usual at this venue. The swim was counter clockwise too, opposite direction of the IM event. 1.5K swim for the Olympic, which is 1600 yds. I swam 1800 though just for fun, or maybe I had trouble staying on course with the wind & waves. Once out of the water, there was a short run to transition. Small transition but it wasn’t chaotic. Smooth sailing in and out. Then on to the bike course which had some new pavement! Olympic distance was a 2 loop bike course. The wind which gave us some hassle in the swim was in full force on the bike. Yes! Love a challenge, right? A few tiny hills but only 577 ft of ascent on the two loops and a total of 25.3 miles. Back to transition for T2. Just as easy as T1. Not crowded. Easy in and out. On to the run which was an out and back course for the 10K. Same route as the IM event in July. Small rolling hills. 213 ft of elevation gain for the 10K. Warm. Its always warm. There is a bit of shade on the back side of the out/back but overall, its usually sunny in this area. Make sure to not forget a hat or visor. This venue is good about having ice due to its notoriously warm runs. So ask for ice, even if you don’t see it out. I did and they did have some in coolers. Took me an extra minute at a couple of the aid stations but it was worth it because I heat up fast. Overall a GREAT race. I’ll definitely be back. 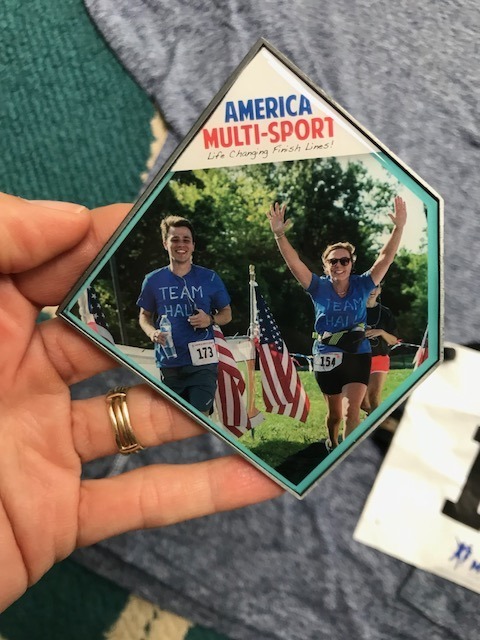 Registration is open for 2019 and I’m considering registering early for that event. I’m also looking at my calendar to see if I can fit in another American Multisport event before the year is out. Lots to choose from between now & September. And bottom line, if we like our “non-branded” events, we need to support them by showing up and racing so they stick around for years to come. Too many great races have been discontinued because of lack of participation! 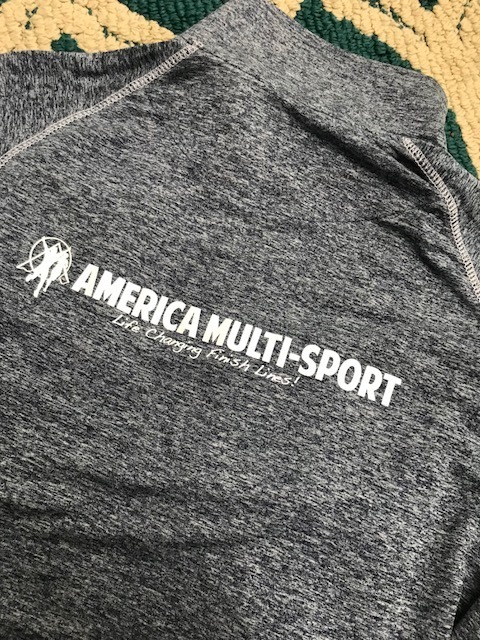 So let’s race American Multisport!! Other than a great race, they also provide great SWAG. 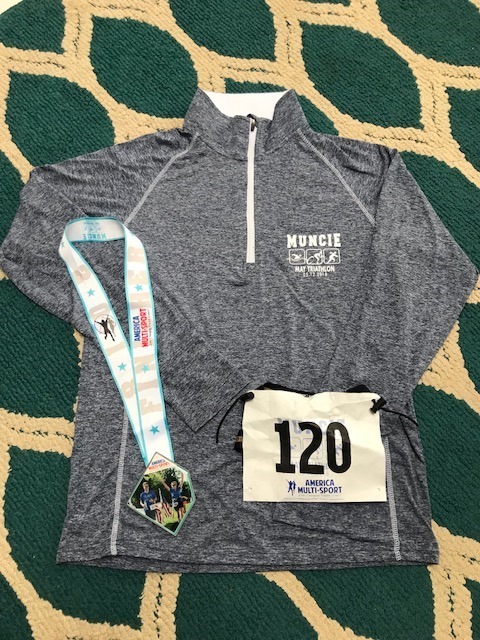 See below for the pullover & finishers medal. I’m wearing the pullover right now. Lightweight & perfect! My next race is the Grand Rapids TRI. Another “non-branded” event. Sprint, Oly, 70.3 & Aquabike in each distance. Still time to register! Race is on June 10th. Hope to see you there! !